Nov. 5, 2012 • Kennedy Space Center has a media gallery of LDCM rocket assembly photos. 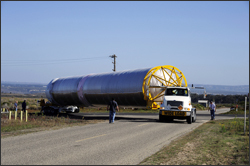 Visit the gallery to see photos of LDCM’s Atlas V 401 rocket being delivered and pieced together at Vandenberg Air Force Base. This entry is filed under Landsat 8 Components, News, Technical News.